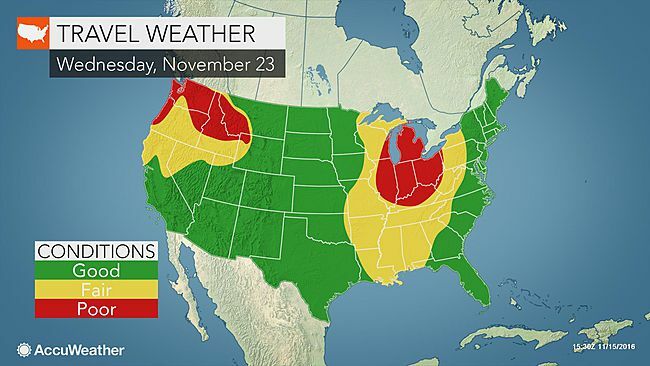 A stormy pattern persisting into Thanksgiving will have impact on the busiest cross-country travel week of the year. More people travel farther during the week of Thanksgiving than any other week of the year, according to the American Automobile Association (AAA). AAA is projecting that 48.7 million Americans will travel 50 miles or more from home Wednesday, Nov. 23, to Sunday, Nov. 27, which will be the greatest volume since 2007, just prior to the Great Recession. Those hitting the highways or airports early to beat the rush may still encounter some trouble from Mother Nature late this week and this weekend. After pummeling the northern Plains with a snowstorm and blizzard conditions, a storm will reorganize and affect the Great Lakes and Northeast this weekend, according to AccuWeather Senior Meteorologist Henry Margusity. Initially, rain and warmth will sweep eastward. "However, the first true blast of much colder air could bring the first snowfall of the season from the Great Lakes to the central Appalachians during Saturday night and into Sunday," Margusity said. Motorists should be prepared for expanding slippery conditions along Interstate 68, I-79, I-80, I-90 and I-99, as well as the Pennsylvania Turnpike and Southern Tier Expressway during Saturday night and Sunday. 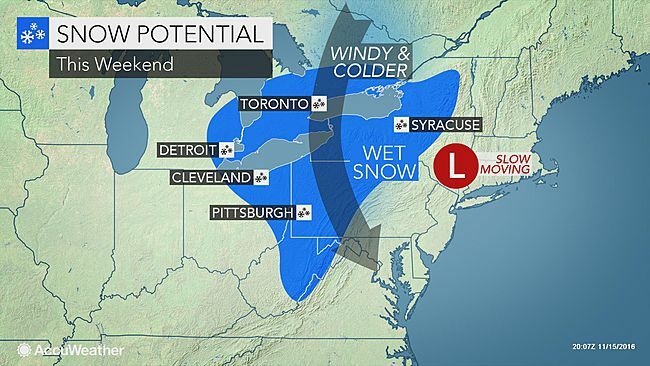 Even in absence of a widespread area of heavy snow, bands of lake-effect snow will occur. There is the potential that strong winds could sweep eastward and hinder high-profile vehicles on the highways and cause airline delays from Chicago to Detroit and Pittsburgh during Saturday to Sunday and from Washington, D.C., to Philadelphia and New York City spanning Sunday to Monday. As one storm exits the Northeast with its charge of cold air, a new storm will arrive along the Pacific coast Sunday night and Monday. Motorists venturing north or south along the I-5 corridor will encounter patches of rain during Sunday and Monday. 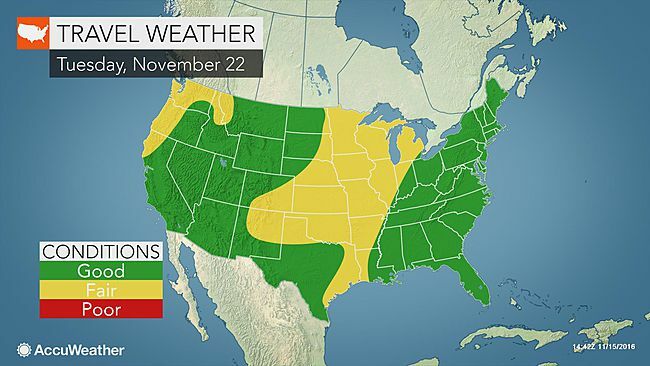 Rain can extend as far south as Los Angeles and San Diego. This new storm will spread patchy snow across the Intermountain West with some rain over the interior Southwest during Monday into Monday night, including the Phoenix area. Where little rain falls, winds may be strong enough to cause some blowing dust along the I-10 corridor. As travel ramps up Tuesday into Wednesday, the new storm will be gathering moisture and producing more substantial precipitation over part of the Central states. While precise timing and the dividing line between rain and snow are not certain this far out, there is the potential for a substantial and impactful storm with rain and snow during the middle of next week. The exact track and strength of the storm will determine where rain versus snow will fall over the Midwest and also the severity of any thunderstorms that swing through areas farther south. Up until any downpours sweep across the South on Wednesday or Thursday, smoke will periodically reduce the visibility around the southern Appalachians. At times, the smoke can be thick enough to slow travel on the highways. The storm has the potential to cause travel disruptions by the middle of the week in major hubs such as Chicago, Minneapolis, St. Louis, Detroit, Cincinnati, Nashville, Atlanta and New Orleans. By Thanksgiving Day, the same storm may be producing drenching rain along the mid-Atlantic and New England coasts with rain or snow inland. As one storm converges the Midwest then the Northeast during the middle of next week, yet another storm will roll into the Northwest. Heavy rain and poor visibility could be a problem along I-5, including the Seattle area, with snow for parts of the Cascades and northern Rockies during the day before Thanksgiving. 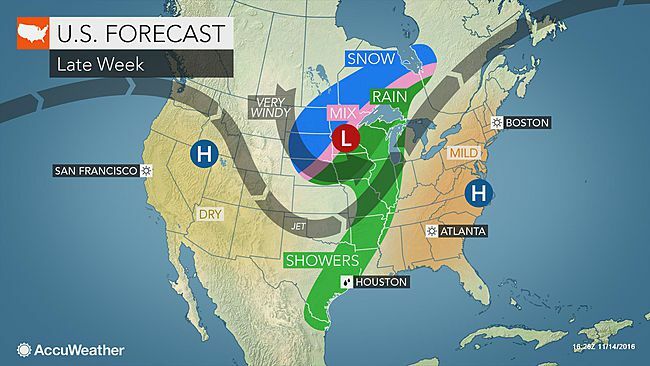 While the track and speed of the storms will vary, the bulk of the direct weather impacts will be over the northern half of the nation leading up to Thanksgiving, according to AccuWeather Lead Long-Range Meteorologist Paul Pastelok. "The greatest chance of some direct and significant travel impacts through this week and during much of Thanksgiving week will be from the I-70 corridor on north to the Canada border," Pastelok said. Regardless of calm weather at your departure or destination point, inclement weather at other airports could displace aircraft and crews for a time and lead to delays or cancellations.